Vada's Blog Stamp Inks and Paper : Vintage Christmas card (Bleach Swipes from 12.2009). 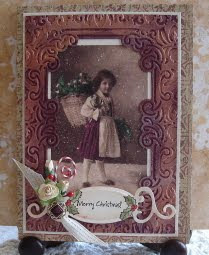 Vintage Christmas card (Bleach Swipes from 12.2009). 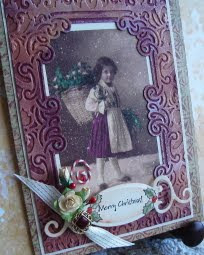 I"m adding this to the "Color Challenge, Vintage Hues" over at Gingersnapes. 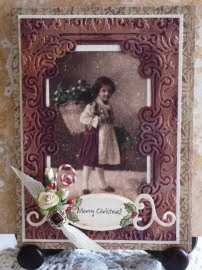 Today I have something new from convention; it is the Cuttlebug Embossed background. These new plates cut and emboss all it one pass. This embossing plate is called “Brocade Window”, and my technique is from Dec 2009 issue called “Bleach swipes”. The little girl graphic is from “Magic Moonlight”. The stamp is from TAC. The printed paper background is from “Basic Grey”. Thanks for stopping in, Have a Wonderful “Black Friday” shopping day. Labels: Gingersnap Creations Challenge Bleach Swipes, Technique Junkie Newsletter. ohhh I love the new cittlebug plate its perfect on your beautiful piece! Gorgeous work Vada! Oooooooo Ms. V, that's STUNNING! Vada, you have done it again and take my breath away with your beautiful creations! Just stunningly gorgeous! That embossing plate is incredible with your image. Love this!! Saw this entry in the GC challenge and just had to pop in and make a comment. Your card is beautiful! The photo is perfect and the framing adds the perfect touch, along with great texture--a great way to enhance the entire card! I love it.